Sweden was one of the few countries that kept a neutral stance during World War II. Jewish populations from surrounding countries migrated to Sweden in hopes of escaping religious persecution during the war at the hands of the Nazi regime. After the war, the population of Jewish people continued to grow. Between 1945 and 1970 the population of Jews in Sweden doubled. 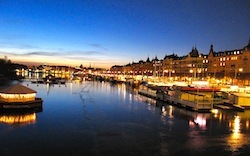 It is estimated that the current population of Jews in Sweden is about 20,000 of which most live in Stockholm. The history of the Jewish population in Sweden mixes several different nationalities into one community. This mix comes through in the Swedish Dumpling Chicken Soup recipe: Stockholm Jewish Penicillin. Pregnant women can use this Jewish Penicillin recipe to fight cold in pregnancy without the threat of over the counter medications. Add chicken and celery and heat on high until it comes to a boil. In a separate saucepan (smaller), mix the flour with a small amount of milk over medium heat. Pour the rest of the milk into the pot. Add nutmeg, salt, sugar and mix well. Stir constantly – the mixture with thicken significantly. Take the saucepan off the heat and add the egg. Mix completely and allow to cool. Once the mixture is cooled, add almonds and parsley. Drop spoonfuls of the dumpling mixture into the boiling stock. Dumplings take two minutes to cook. They will float to the top when ready.